Just about every product imaginable can be purchased via catalogs. J.C. Penney offers a general merchandise catalog, while other retailers provide niche catalogs, selling products such as crafts, art supplies, books, computers, and shoes. Today it is possible to live in remote areas and purchase everything needed for home, business, and hobby use without leaving the comfort of one's home! A catalogue of pressures for retailers mean shoppers are benefiting from record levels of pre-Christmas discounting, according to a report. Sky News. Monday, 17 Dec 2018 11:46:00 +0000. The Amazon catalog, "A Holiday of Play," is about 70 pages long and contains scannable QR codes for instant ordering on some items. CNBC. Tuesday, 06 Nov 2018 18:35 GMT. Catalog shopping has a long and storied history in the United States. Catalogs basically came on the scene when printing did; the first catalogs were produced by printers to list and advertise their publications. Printers would make up a one-sheet catalog listing their wares, and would inform potential buyers where they could meet the vendor — usually a local inn or library — to make their purchases. In time, it became clear that many merchants outside the printing industry could also benefit by publishing product catalogs. As America grew westward during the nineteenth century, the expansion created a broad market for household goods and farm equipment. The number of farms increased and farms were becoming more mechanized, yet these farms were often isolated in the rural landscape. Distant stores and high-priced itinerant peddlers were often the only means of purchasing needed products and supplies. These factors made way for catalog and mail order retailing to become accepted. Catalog vendors could purchase quantities of products at wholesale prices, so they could offer lower retail prices. As postal service and railroads were expanded, better methods of delivering purchases added to the ease of catalog shopping. Montgomery Ward became the catalog of choice for many farmers. 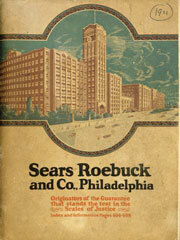 Sears, Roebuck and Company also embraced the concept of national retail marketing via catalog. These catalogs, and others like them, included farm tools, household items, clothing, toys, and even entire houses in kit form! Specialty catalogs came and went over the years as well, featuring items that people wanted to buy but couldn't find locally. Orvis, for example, distributed a catalog that sold fishing lures, while Tiffany & Company published a catalog featuring items imported from China and Europe. Through catalog shopping, small rural areas could be reached as well as cities. 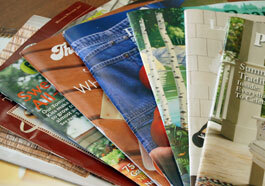 In recent years, catalogs have frequently been made available online for easy access via the Internet. This has enabled merchandisers to reduce catalog printing and mailing costs and has enabled consumers to find information about various products and order them conveniently, from anywhere in the world! Availability of these online catalogs has also saved us getting the "deluge" of printed catalogs in the mail as the holiday shopping season approaches. Either way, via the old style print catalogs or the newer, online catalogs, catalog shopping has helped us to find just the right product when we've needed it. This specialty retailer offers unique and hard-to-find products for home & office, health & fitness, outdoor living, and travel & auto. This hard goods and soft goods retailer features a holiday Wishbook, a power and hand tools catalog, and specialty mailers offering a unique array of items. This bedding and bath catalog retailer features a broad selection of white goods, home accessories, and down products. One of the nation's leading fashion retailers features a wide selection of quality apparel, shoes and accessories for men, women, and children. This New York-based fashion retailer offers online catalog shopping for fashions to wear now plus special values. This online shopping site features books and a broad range of other merchandise. This factory-direct online store offers casual dinnerware and accessories. This catalog and online retailer markets gifts and household products as well as fashion accessories. Online catalog for home environment gifts and home furnishings. Shop online for home decor and bed & bath products as well as consumer electronics and innovative home storage & organization products. Non-electric catalog features kitchen gadgets, appliances, stoves, books, tools and farm implements, home and garden items, toys, and more. Offers smarter, better products for lower body health, including shoes, socks, slippers, and foot care products. Mail order catalog search directory and online shopping portal for catalog shoppers. Founded in 1972, this organization strives to assist businesses and entrepreneurs with mail order marketing and other forms of direct marketing activities. This organization is a global trade association of businesses and non-profit organizations that use and support various direct marketing tools and techniques, including catalog marketing.